Tournament poker is different from standard ring game poker. Some people excel at it because they understand the proper strategy adjustments and when to make them. This text is the first one that explains tournament strategies which only a small number of players have mastered. It assumes you already know how to play poker well, but aren't knowledgeable about tournament concepts and when and how to use them. Some of the ideas discussed include the effect of going broke, The Gap Concept, how chips change value, adjusting strategy because the stakes rise, all-in strategy, the last table, making deals, and The "System. 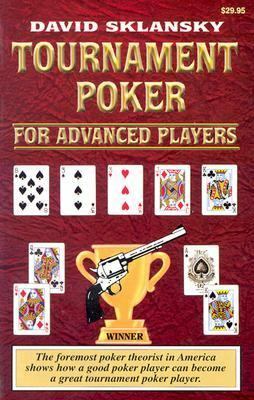 "Sklansky, David is the author of 'Tournament Poker for Advanced Players', published 2002 under ISBN 9781880685280 and ISBN 1880685280.